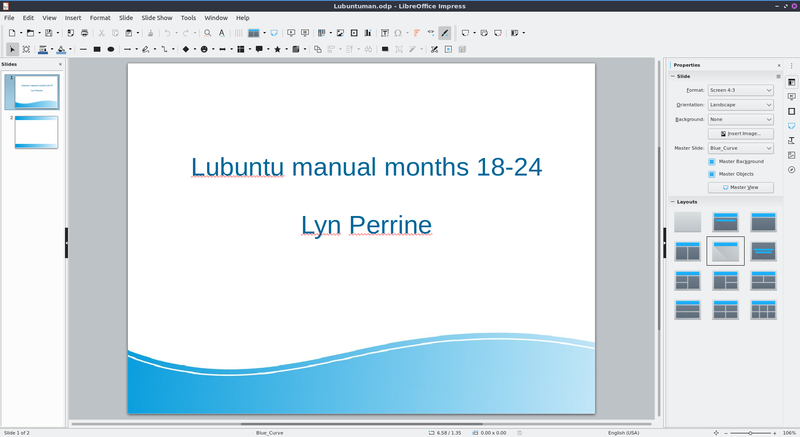 Libreoffice Impress is a program to present presentations. When you open libreoffice impress you will get a dialog to select a template with a preview select which one you want to use by left clicking and then click open. To add a title to a slide click where it says click to add title. To open a previous presentation you have been working on press the button that looks like a folder with a piece of paper in it and navigate to the file you want and open it or File ‣ Open. To view your recently opened files press File ‣ Recent Documents. To save your presentation press the button that looks like a floppy disk or File ‣ Save. To save a new copy under a custom file name File ‣ Save As. To save a file as a pdf File ‣ Export as PDF. To type text into a presentation click in one of the boxes for your theme and type in the text with controls for the text on the right hand side. To insert a picture press the button with what looks like a photograph of a tree and select the file you want to insert or Insert ‣ Image…. To insert audio or video to your presentation Insert ‣ Audio or video. To change the layout of your slide Slide ‣ Layout ‣ Your prefred layout. To apply a bold effects on your fonts select the text with the mouse and then press Control+ B or Format ‣ Text ‣ Bold. To make text italic with first select it and then press Control + I or Format ‣ Text ‣ Italic. To underline your text select it and then press Control+U or Format ‣ Text ‣ Underline. To increase your font size press Control + ] or Format ‣ Text ‣ Increase Size. To decrease your font size press Control + [ or Format ‣ Text ‣ Decrease Size. To make text superscript select it and press Shift + Control +P or Format ‣ Text ‣ Superscript. To make text subscript select it and press Shift + Control + B or Format ‣ Text ‣ Subscript. To spell check your presentation press F7 or Tools ‣ Spellcheck. If you want to print your slides you can press Control + p or File ‣ Print. To open up your printer settings File ‣ Printer Settings. If you want to paste text into a slideshow press Control + V or Edit ‣ Paste. To copy text select it first and then press Control + C or Edit ‣ Copy. To cut text select it first and the press Control +X or Edit ‣ Cut. To paste text without formatting pres Control +Shift + Alt +V or Edit ‣ Paste Unformatted Text. To insert a special character Insert ‣ Special Character. To center your text press Control + E or Format ‣ Align ‣ Center. To have your text aligned to the right press Control +R or Format ‣ Align ‣ Right. To align text to the left press Control + L or Format ‣Align ‣ Left. To bring up a dialog to customize the character or your text Format ‣ Character or right click on a textbox and select Character from the context menu. The Family lets you choose the font family for your text. 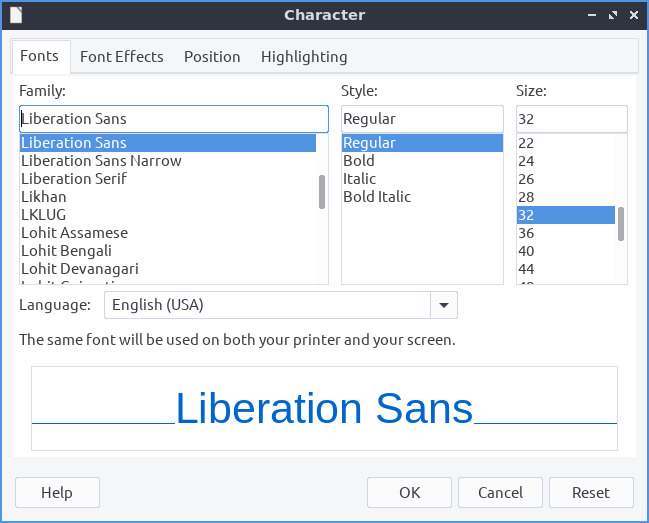 The Style is where you can select the of your font. The Size Lets you change the font size. The Font effects tab has even more effects for fonts. The drop down Font Label changes your font color. The Overlining menu lets you make a style for how to draw lines over the text. The Overline Color brings up a drop down menu to choose what color to draw a line over something. The Effects has effects for your text. To have many different strikethrough effects to your text select the one you want from thedropdown Strikethrough menu. To change whether the font appears to be sunken or raised from the presentation use the menu for Relief. To choose how you want your text underlined choose an option from the Underlining menu. To change the color of your underline use the Underline color menu. To have effects with how your is vertically with the rest of the line select the Position tab. To make your text superscript press the Superscript button. To make your text subscript press the Subscript button. The menu for Scale width changes how much to scale the width of the font. 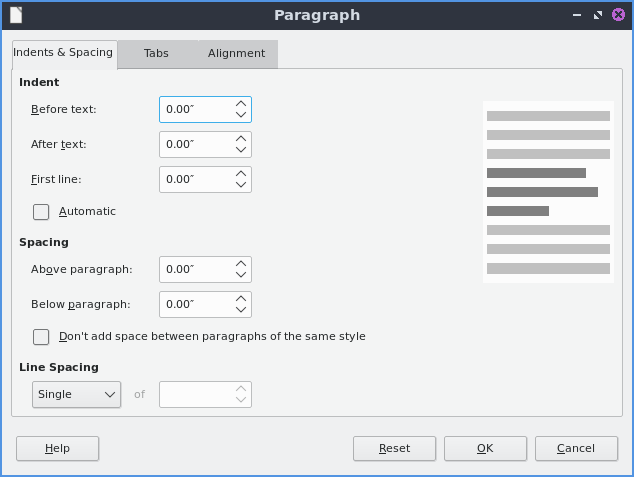 To format the paragraphs and spacing of text Format ‣ Paragraph. The Indents & Spacing Tab has settings for indenting your text and the space between lines. To increase the indent right before the text starts increase the Before text field. To change the indentation after your text change the After text field. To have a different indent for your first line change the First Line filed. To change the amount of space above a paragraph change the Above paragraph field. To change the space below a paragraph change the Below paragraph field. To change the line spacing from this dialog window select the drop down menu Line Spacing. To reset your changes in this window press the Reset button. To not apply your changes press the Cancel button. To apply your changes and exit the window press the Ok button. To change settings on the alignment of text is on the Alignment tab. To choose which way you want your text aligned choose the Left, Right, Center, or Justified. To switch between left to right or right to left text switch the Text direction menu. To toggle bulleted lists on your points Format ‣ Lists ‣ Bulleted List. To toggle a numbered list for your points Format ‣ Lists ‣ Numbered Lists. To change your line spacing on your presentation Format ‣ Spacing ‣ Line spacing and select the spacing you want. To increase your spacing between paragraphs Format ‣ Spacing ‣ Increase Paragraph Spacing. To decrease your spacing between paragraphs Format ‣ Spacing ‣ Decrease Paragraph Spacing. To move settings with a box of text left click on the border of the box of text. To move the text box click and drag on the border. To resize both vertical and horizontal size together left click on the corner and resize the text box. To resize how tall the text box is click the box at the top or bottom and drag to the desired size. To resize the horizontal size only select the box on a vertical size of the box. To search for text press Control + F or Edit ‣ Find to search for text. To find and replace text press Control + H or Edit ‣ Find and Replace. To move a text box around you can left click on the text box and drag it to the desired position. To resize a text box click on the corner and drag to resize to the desired size. To insert an image click Insert ‣ Image. To drag your image to where you want it left click and drag the mouse to where you want the image. To resize the image without distorting it click one of the boxes on the corner and resize to the size you wish. If you want to delete an image press Delete. To replace an image right click the image and Replace will bring a file picker up to pick a new image. To crop an image right click on the image and select Crop. To save an image out of a presentation right click on the image and select Save …. To change the zoom of you presentation View ‣ Zoom ‣ Zoom to bring up a window to manage your zoom. If you just want to zoom to fit the page width View ‣ Zoom ‣ Page Width. To change your zoom to 100 percent View ‣ Zoom ‣ 100%. On the left there is a panel showing what slides you currently have in left side of the window. To insert a new slide right click on this panel on the left and select new slide or press Control + Enter. To delete a slide on the left hand slide right click and select delete slide or Slide ‣ Delete Slide. To create another copy of a slide right click and then select duplicate slide. To change the type of slide Slide ‣ Layout ‣ Your choice of slide here which has many different options. To move a slide down Slide ‣ Move ‣ Slide Down. To move a slide up Slide ‣ Move ‣ Slide Up. To move a slide to the start Slide ‣ Move ‣ Slide to start. To move a slide to the end Slide ‣ Move ‣ Slide to end. To start a slideshow press f5 or the button the looks like a tv with a triangle on it or slideshow ‣ start from the first slide. To start a slideshow from the current slide press Shift + f5 or Slideshow ‣ Start from current slide. To exit the slideshow press escape. To get to the next slide of the slideshow left click or press the right arrow key. to get to a previous slide in presentation mode press the left arrow key or right click previous. To view your slides right next to each other View ‣ Slide Sorter. To rearange your slides click and hold a slide and drag the slide between the slides you want to move to. To switch to an outline view of just text View ‣ Outline. To switch to an outline View ‣ Outline. To switch back to your normal view View ‣ Normal. 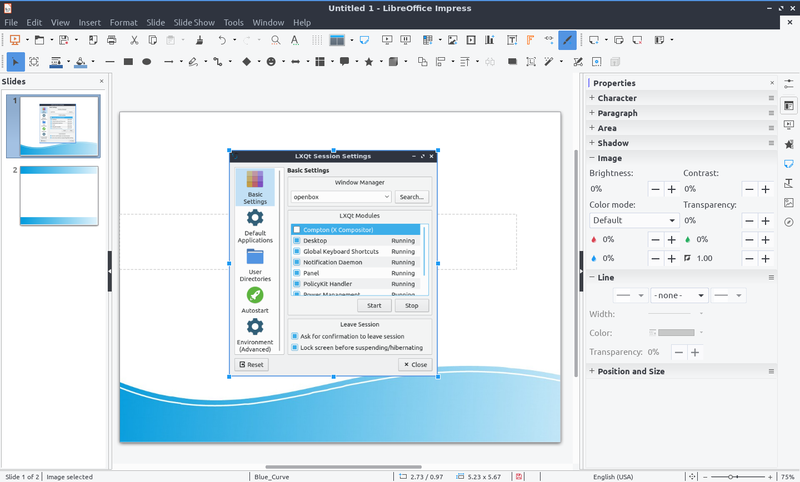 Lubuntu ships with version 6.2.2.2 of libreoffice impress.